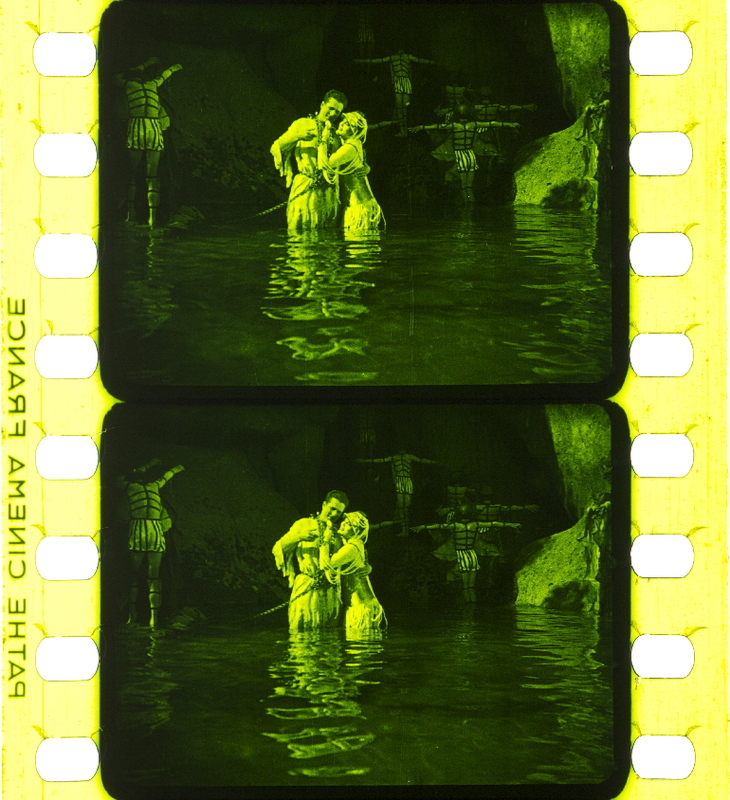 Tinting and toning in Venus of the South Seas (1924). Credit: Library of Congress. Photograph by Barbara Flueckiger. Trailer, Technicolor No. III dye-transfer print. Credit: Library of Congress. Film: Ben Hur (USA 1925, Fred Niblo). Photograph by Barbara Flueckiger. Le 28 juillet 1906, il semble que l’équipe réalise son premier combiné teintage et virage réussi sur le titre la Vie au Japon, les rapides de la rivière Ozu30. Ainsi le virage sépia est associé à un teintage bleu. Dubois reconnaît qu’il est cependant difficile pour le combiné d’atteindre une régularité parfaite31. 30 La Vie au Japon, les rapides de la rivière Ozu, film réalisé par André Legrand, production Pathé, 1906, n° 1493 (voir catalogue Bousquet). Desmet, Noël; Read, Paul (1998): The Desmetcolor Method for Restoring Tinted and Toned Films. In: Luciano Berriatúa, Manlio Brusatin, Noël Desmet, Enrico Fornaroli, Giovanna Fossati, Bertrand Lavedrine, Bob Mabberley, Nicola Mazzanti, Ruggero Pierantoni, Paul Read and Sonja Snoek: Tutti i colori del mondo. Il colore nei mass media tra 1900 e 1930. = All the colours of the world. Reggio Emilia: Edizione Diabasis, pp. 147–150. Restoration of coloured monochrome films was, until the 1960’s, carried out almost exclusively by conventional black and white duplication and the colours were simply recorded in writing. Little attempt was made to reproduce the original colours for archival storage or for display. During the 1960s, and up to today, a colour internegative made on the current Eastman Colour Internegative Film was and still is, the most frequent means of copying the coloured images. The earliest attempts were usually poor and of too high a contrast but today a closer visual match to the archive original can be achieved. Some laboratories use camera negative films for some purposes, especially for stencilled prints, for the more faithful rendition of pastel colours, especially reds and pinks. 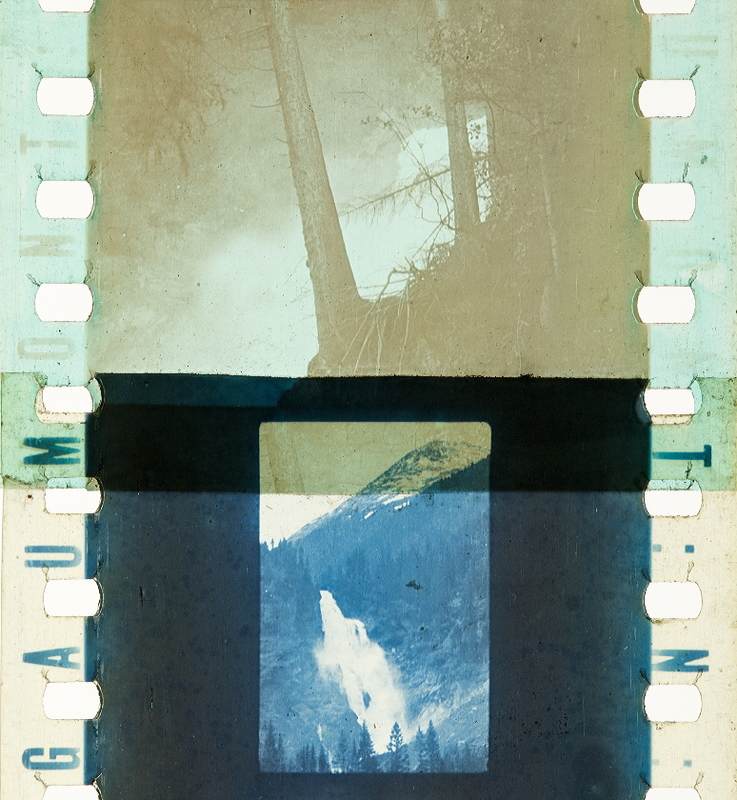 The resulting colour print represents the colours left in the film today after whatever fading has occurred, and for many years archivists have had reservations about recording these images in their faded state, rather than seeking to reproduce the pristine image. In many cases the original print is too high in contrast to be printed onto Colour Internegative without some reduction of contrast by “flashing”. The technique used has become a standard for the reduction of contrast. – Subtractive dyes are restricted in the saturations achievable, some of the old tint and tone dyes are outside the range. – Colour films have less archival permanence than a black and white record. 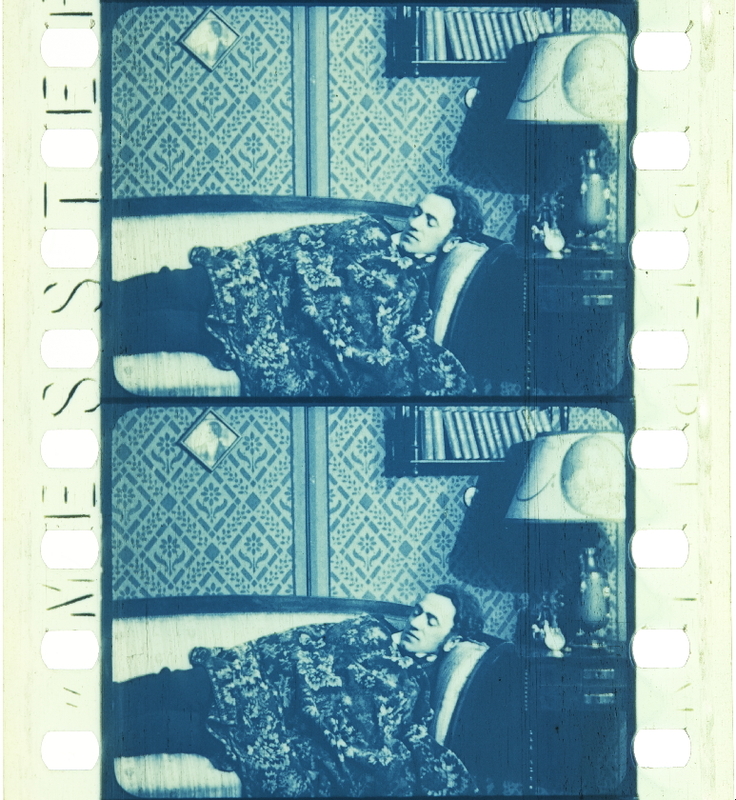 Other coloured films are less discrete in their colour and either the entire frame is suffused with one colour [tinting], or the image is coloured a single colour [toning], or a combination of the two techniques was used. In these cases a wider range of techniques for restoration exists. Copying the original onto Eastman Colour Internegative, and the resulting colour negative is printed onto a modern colour print stock. Using the original tinting or toning technique on modern print stock, as described in the other paper in this issue. The single pass method is still widely used, but this paper describes the double pass method, which is capable of a wide range of effects. Any black and white duplicate negative can be printed onto a conventional modern colour print film to achieve an image of almost any colour [achieved by varying the grading with filters or light valve settings] from a neutral black or grey, to any saturated primary. This does make it possible to achieve quite good matches with many of the tone colours that were available. 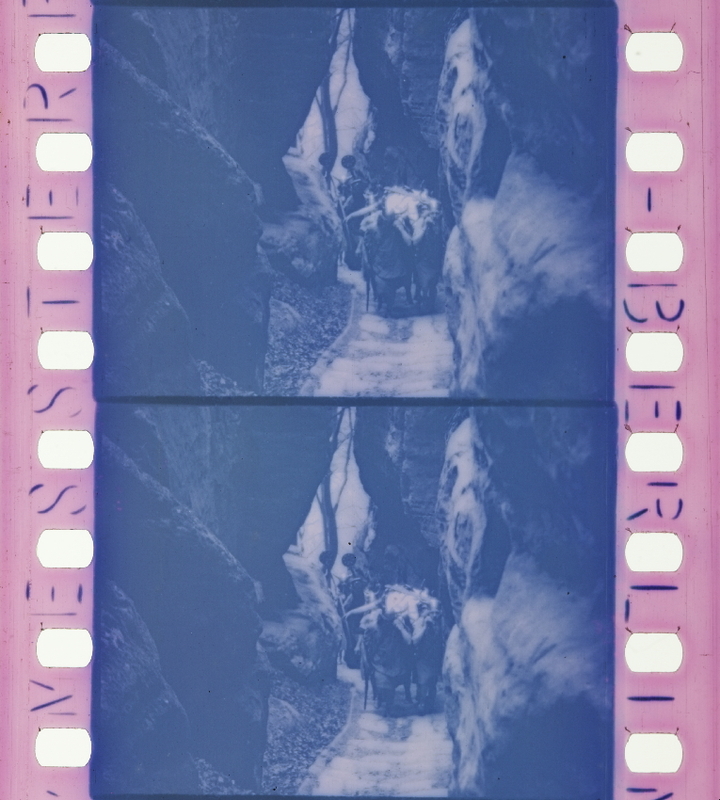 However by this “single pass” method it is not possible to copy satisfactorily tinted films or double toned or tinted and toned films. If the image is printed somewhat dark an effect not unlike tinting can be acheived but the image loses much of it’s aethetic value. The overexposure has the effect of producing hazy monochromes and the results obtained from this method are simply not of high enough contrast and the high densities are not black but simply a denser colour. Occasionally good results are obtained but the effect is best with blues and day-for-night shots, and other colours are very difficult to achieve. Ther is no doubt that in certain circumstances where a film is entirely toned in a variety of strong colours especially if the colours were produced by colour development or by mordanting this simple and inexpensive method is very effective. The negative can be graded visually using a colour analyser [Debrie, Filmlab Colour Master, or Hazeltine] without difficulty. 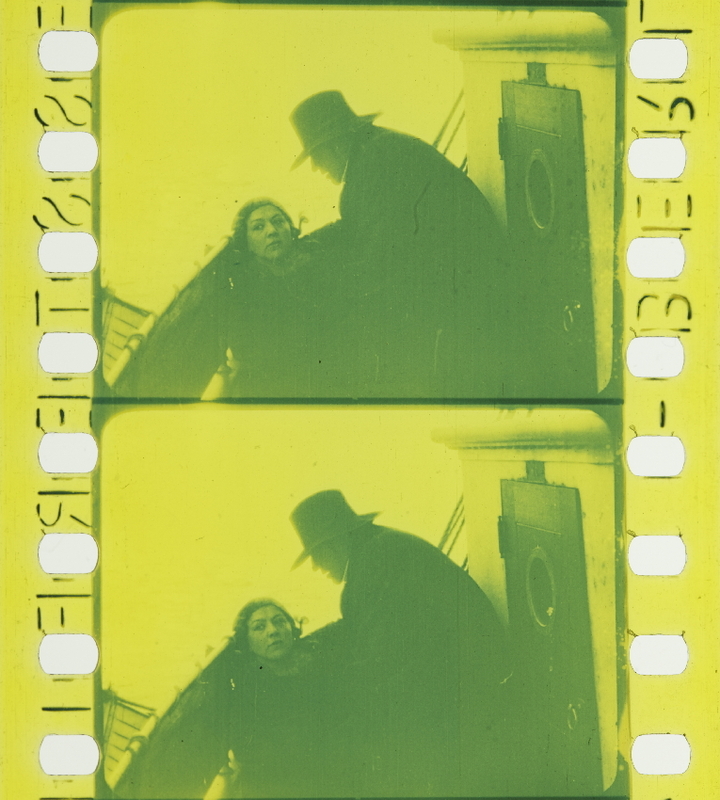 This system devized by Noël Desmet of the Royal Belgian Film Archive has been used since the 1970’s to try to restore some of the strong colours and dramatic effects of early tinted and toned prints, without the cost of using a colour intermediate film. 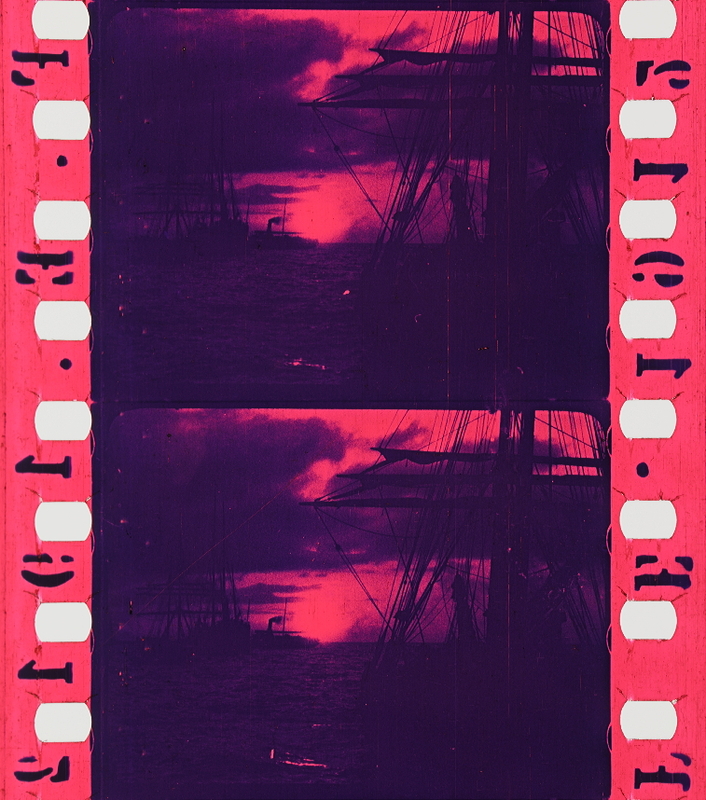 It is not intended to precisely match the colours of a particular print but provide an extensive pallette from which to choose colours in the same films were duplicated to make a normal black and white duplicate negative and notes kept of the original colour before the decaying nitrate print was destroyed. Noël Desmet’s method enables these colours to be put back as tints or tones or as a combination using the archive duplicate negatives as a starting point. Although the colours were not intended to specifically yield a match with the originals, if enough trial and error time is spent quite close matches are possible. The overall dramatic effect is probably very close to that of the original. A number of laboratories use this method today. Working independantly Dominic Case [SMPTE, 1987] in Australia has used a similar system but making the monochrome duplicate negative on Eastman Colour Internegative. The choice of material was probably influenced by the idea that a masked negative material would make a more stable starting point than a black and white negative and make grading and analysing reasonably straightforward. Comparisons of the two methods suggest that the results are very similar but the use of a black and white negative material results in finer grain on the final print, and the Desmetcolor is considerably lower in cost. Noël Desmet commenced his work to find an alternative procedure to using a modern colour negative partly to reduce the cost of colour internegative and also to restore early coloured films that had faded. Colour negatives could only copy the existing faded result. Starting with an original tinted, toned or combination nitrate print a black and white negative is produced on a panchromatic emulsion such as Eastman Fine Grain Duplicating Panchromatic Negative Film 5234 set up to achieve a contrast [gamma] of about 0.50. This gamma seems to be a good starting point but a higher contrast is preferred for some eventual colours. A series of colour tests are made by printing a piece of film base of the material used for the negative onto a colour print film [such as Eastman Colour Print] at various printer light settings on a rotary contact additive lamp house printer [such as a Bell and Howell Model C]. A good method of establishing a starting point for the range of colours is to put the test film base onto a video colour analyser and vary the exposure settings to see the effect of a flashing exposure. It will be found that many of the best effects are achieved by setting one printer light valve to zero [ie using the zero close facility] and varying the other two relative to each other. Strong colours can be obtained and they are quite repeatable. The colours selected can be selected for two different purposes – to create a coloured image simulating a toned image, and to create an overall tint that simulates the tint colours. On the same rotary printer the duplicate negative is printed onto the colour print film at a setting of the light valves needed to produce the tone colour required. Generally little or no scene to scene grading is required if the original was a graded print and the duplicate negative procedure was well set up and was exposed at a single light estting [ie was a one-light duplicate]. Some trial and error may be needed to acheive this or the negative can be scanned in a video analyser. If scene to scene grading is required then the ratio of the R, G and B setting must remain the same throughout the sequence. Even so grading by this technique is not advised as the colour does change slightly from scene to scene. On processing the image will be a monochrome of the colour selected with the unexposed areas remaining white. Starting from the black and white duplicate negative a colour image is printed in one pass through the printer onto colour print film, followed by a second pass of the print film alone to produce the tint colour background. The effects of this combination efect are not entirely predictable but certainly do give subtle results very similar to the early combination prints. Both the Desmet and the Case methods are capable of refinement for production purposes to produce multiple prints or to introduce conventional intertitles by operating the two passes as an A and B roll printing system. Nor is it difficult to produce in just the two passes needed, different language versions, or different intertitle versions. The duplicate negative constitutes the A roll and is exposed to generate the neutral or coloured [toned] image. Black spacing is cut in where any titles are to be printed from the B roll. 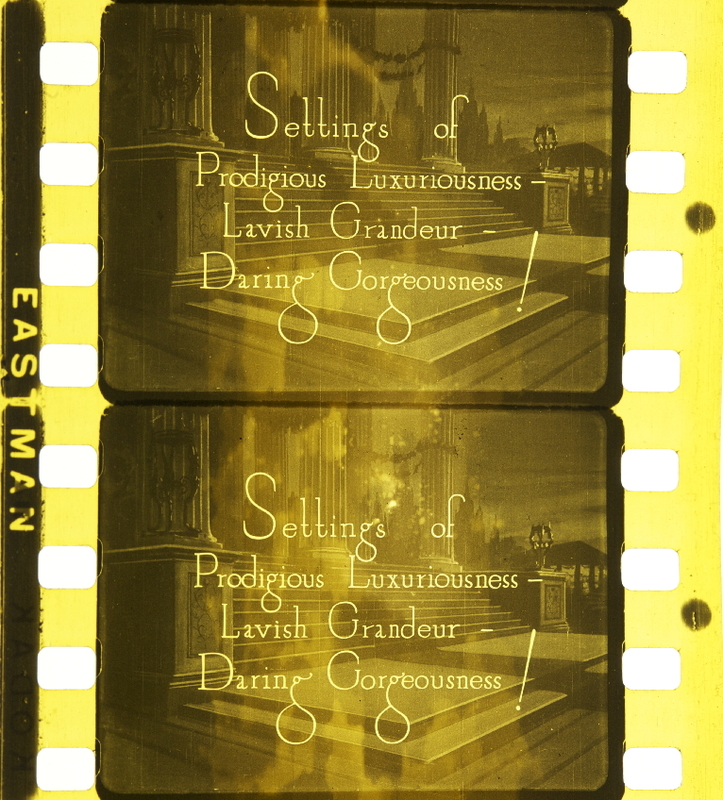 Another roll of clear film [with intertitles cut in if necessary] would constitute the B roll and be used to create the background tints, with the interfiles inserted at the A roll black spacing positions. If different language intertitle versions are needed a new B roll can be prepared. With a modern printer using FCC or punchtape the A roll could be exposed in one direction and the B roll in the reverse direction, avoiding any rewinding of stock in the dark, with its associated risks. The benefits of this procedure are in both cost and the easily achieved control of contrast. The pricing of the service by a laboratory is similar to that of a fully graded colour print from a colour negative with an “A and B” surcharge. As more investigation is carried out into the original dyes it seems that it may be possible to estimate the degree of fading that has occurred. This method provides the only mechanism for reproducing controlled colours. Desmetcolor has drawbacks, not least because colour film is still used for the print. However the resulting image may be no less stable than the original dyes. One aspect being investigated now is the Desmetcolor ability to produce the strong saturated colours of some of the dyes used in the early years of the cinema, but which have faded over the years. Already Noël Desmet reports success in reproducing the colour of vivid “fixed” Iron Blue as produced by Soho Images, using the original Eastman procedure of 1922. However Soho Images reports that some saturated red and green dyes used for tinting and toning may not be accurately reproducible. This is not surprising – cyan magenta and yellow subtractive primaries are limited in the range of colours possible […]. Inevitably, due to these limitations of cyan, magenta and yellow as primaries not all hues and saturations are going to be possible, but certainly more of the saturated colours are possible by Desmetcolor than by any other colour print film technique. On the same rotary printer the black and white duplicate negative is printed to a neutral grey image on colour print film [this, too, can be established on a video analyser] in the first pass through the printer. The print film is then passed back through the printer [ie a second pass] and exposed to an overall flash exposure [in much the same way as preflashing to reduce contrast] at printer light valve settings chosen for the colour of the tint produced. On processing the image will be monochrome black and white suffused with a tint over the entire frame area. The black image areas will be black and the unexposed highlight areas coloured. Layton, James; Pierce, David (2015): The Dawn of Technicolor. Rochester: George Eastman House, on pp. 99–102. “For the big-budget production of The Ten Commandments, the present-day story and its historical parallel biblical narrative would be told sequentially, with a prologue of the story of Moses and the escape from the Egyptians followed by a straightforward “modern story.” Much of the budget and nearly all of the spectacle went into the prologue dealing with the Bible’s Book of Exodus. DeMille was planning special effects using the Williams traveling-matte process, which combined miniatures with live-action, and spot-coloring for the Pillar of Fire and other color effects. Always striving for showmanship and production value, DeMille responded when Kalmus offered to photograph the major sequences in Technicolor without cost; if DeMille liked the result, the studio could buy it; if not, Technicolor would junk the footage. The Technicolor shots in the final film consist of the horsemen and chariots of Pharaoh and his soldiers pursuing the Israelites over the plains (filmed at Muroc Dry Lake in the Mojave Desert), until just before the Pillar of Fire (printed in “special color”). Trucks carrying the black & white cameras and another truck with the Technicolor cameras raced at 40 miles per hour, ahead of the horses. A major film such as The Ten Commandments, with a budget of nearly $1.5 million, could justify sequences in Technicolor. While the experience “sold him on color,” according to Ray Rennahan, DeMille would hold off on using the process until his next biblical spectacular, The King of Kings, released in 1927.47 Of course, Kalmus needed to convince the industry that Technicolor was practical for ordinary program pictures, not just road-show spectaculars. 3.12. Filming The Ten Commandments (1923) on location at Guadalupe Dunes, California. Ray Rennahans two Technicolor cameras (far left and third from right) film DeMille’s staging of the Exodus alongside six black & white cameras and two stills cameras. 44 Rennahan, AFI Oral History with Charles Higham. 45 The Ten Commandments cutting continuity, undated, Paramount Pictures Scripts, Margaret Herrick Library, Academy of Motion Picture Arts and Sciences. 46 “Newspaper Opinions: The Ten Commandments!” Film Daily, December 26, 1923, 2. Street, Sarah (2012): Colour Films in Britain. The Negotiation of Innovation 1900-55. Basingstoke, Hampshire: Palgrave Macmillan, on p. 20. Abel, Richard (1996): Pathé’s “Heavenly Billboards”. In: Monica Dall’Asta, Guglielmo Pescatore and Leonardo Quaresima (eds. ): Il colore nel cinema muto. Bologna: Clueb, pp. 56–76, on p. 61. 53 D. S. Hulfish, “Colored Films of To-day,” The Nickelodeon (January 1909), p. 15. 54 Marette, “Les procédés de coloriage mécanique des films,” pp. 4–7. 55 See, for instance, “Pathé-Frères,” New York Dramatic Mirror (14 November 1908), p. 12. 56 P. Cherchi Usai, “The Color of Nitrate,” Image 34. 1–2 (Spring-Summer 1991), p. 38, n 12. “Collocata in un regime percettivo incerto tra bianco e nero e colore, tra riproduzione fotografica e chimica pigmentaria, l’immagine monocromatica presenta uno statuto costituzionalmente debole, incerto e ambivalente4. Del bianco e nero, essa mantiene la basilare tessitura dei rapporti chiaroscurali, convertendola al contempo in scala monocromatica. Nell’immagine tinta, i neri restano tali mentre i grigi e le trasparenze si colorano della tinta impiegata (blu, giallo, rosso, ecc.) proporzionalmente al loro grado di chiarezza. La forma che ne deriva può essere definita come un nero e colore (nero e blu, nero e giallo, nero e rosso). L’immagine virata è frutto del processo complementare: i neri e i grigi sono convertiti chimicamente in pigmento in proporzione della rispettiva chiarezza, mentre le trasparenze restano tali: la forma ottenuta può definirsi come bianco e colore (bianco e blu, bianco e giallo, bianco e rosso)5. Stando l’uno della parte del chiaro e l’altro dalla parte dello scuro, i due processi risultano a tutti gli effetti complementari, oltre che pienamente compatibili sul piano tecnologico. Per questo, essi possono essere impiegati in combinazione, restituendo un’immagine bicromatica in cui la scala dei chiari viene convertita in un colore (tintura) e quella degli scuri in un altro (viraggio)6. La forma così ottenuta, che potrebbe definirsi con la formula colore e colore, risulta spesso praticata in modalità che traslano sul piano cromatico la contrapposizione chiaroscurale del bianco e nero, attraverso l’impiego di due tinte poste tra loro in un rapporto di prossimità o di contrasto. 4 Cfr. Aumont 1995b, pp. 42–44. 5 Riprendo le espressioni bianco e colore e nero e colore da Dubois 1995, pp. 75–76. Espressioni analoghe risuonano curiosamente in un articolo del tempo: “il Cinema, allo stato attuale, è, semplicemente, una xilografia: serie di chiari e scuri: bianco o nero; non più; o pure verde e nero; o giallo e nero” (Ungaro 1917, p. 2). 6 Dal punto di vista tecnologico va rilevata una differenza: mentre il viraggio converte effettivamente i sali d’argento del supporto in pigmento colorato, la tintura comporta la stesa di una soluzione colorata sul supporto. Per la stessa ragione, il viraggio era limitato a una gamma più ristretta, mentre la tintura poteva produrre una gamma potenzialmente illimitata di colori. Aumont, Jacques, a cura di (1995a), La couleur en cinéma, Mazzotta-Cinémathèque française, Milano-Paris. Aumont, Jacques (1995b), Des couleurs à la couleur, in Id., a cura di, 1995a, pp. 30–49. Dubois, Philippe (1995), Hybridations et métissages. Les mélanges du noir-et-blanc et de la couleur, in Aumont, a cura di, 1995a, pp. 74–92. Pierotti (2012): La seduzione dello spettro, pp. 52–53.